A few days ago, I received a humorous email with an image of Santa saying "Hey People, can we calm this s*** down, it's only November!" After three or four weeks of intense TV advertizing by retailers determined to put an end to the economic gloomfest with one furious Christmas shopping season, I was certainly feeling Santa's frustration. But now it's December so perhaps time to start thinking about what your nearest and dearest golfers might like to wake up to on Christmas morning. Below are a dozen or so items I have purchased, borrowed, sampled, tried, tested, used, seen used, read, worn, and played, in the last few months, and all of which I happily recommend. This is stuff the typical golfer in your family will definitely appreciate. Joe Holdridge (Joe's Indoor Golf Lab on Hannegan Rd) currently has his 1,600cc 1964 VW Beetle with a new engine up for sale at $2,995. Give him a call on 360-752-3337. For me, Tour Tempo remains the greatest single swing aid/swing trainer available besides an alignment and ball position device (which you can make in your garage with two sticks), and a weighted club. The results I've seen from people trying it for the first time have been remarkable. 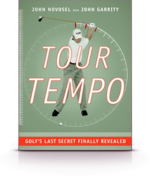 By listening to the Tour Tempo rhythm that best suits their innate swing tempo, those lucky enough to receive the gift of Tour Tempo on Christmas morn, will almost instantly remove all the technical stuff from their inner soundtrack and focus entirely on matching their swing with the Tour Tempo beats. With just a few minutes' exposure to those beats, they will generate faster clubhead speed, and swing through the ball without any hint of a 'hit', the motion becoming fluid and powerful. The book explains the theory but it's the CD in the back that will change your game. Put it on, pump up the volume, swing a club (making sure you don't hit any lightbulbs or take a divot out of the carpet) and just let the beats take over. The book and CD hit the shelves a few years ago and, since then, have spawned all manner of related products. They're all worthy items, but start with the book and CD and you can't go wrong. 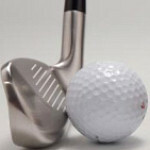 Get it for: The golfer you know who overthinks his swing and loses speed and fluidity as a result. Okay, here's another aid that is definitely worth trying (so just add it to the alignment tool, weighted club and Tour Tempo). We read that in order to hit the ball powerfully up into the air, and with back spin, we must hit down on the ball. Ideally the clubhead (irons, not driver which is moving up as it makes contact) strikes the ball a split second before moving down into the turf and taking a shallow divot. A lot of amateur golfers don't do this, instead assuming that in order to get the ball airborne, they must help it up. The Tour Striker will help them make this ball-first contact with the shaft angled forward (hands ahead of the clubhead at the moment of contact), and the clubhead moving powerfully down and into the turf. It will certainly take the golfer new to the Tour Striker a few tries to get used to what is being asked of them, but once it clicks and they get used to their new swing sequence, the results should be worth every ounce of effort. Get it for: The golfer you know who tries to help the ball into the air...and does inconsistently and powerlessly. I've been waiting for something like this to come along for ages. 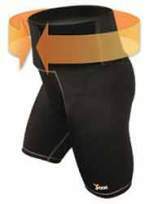 Jox Athletic shorts are breathable, provide enhanced circulation, assist in reducing lactic acid build up, and relax the lower body and upper leg muscles. The posterior mid-transverse section of the belt supports the L4 , L5, and lumbosacrel parts of the spinal column, providing a strong-hinge like effect for the upper torso and reinforcing support at the axis of rotation. Clinical trials have shown people who wear Jox Shorts enjoy a 19% decrease in pressure on the lower back than people wearing regular shorts. They are designed to provide extra support for static and dynamic activities that require extension and rotation...like golf. The pouch on the inside of the belt is able to hold instant Jox Hot and Cold Pax. And if that's not enough for you, they are mighty comfortable too. Get it for: The golfer whose painful back prevents him/her from swinging with complete freedom. It's difficult to estimate just how many shots these clubs have saved me his year. As I age and with an ever-worsening back, I get all the help I can. An extra hybrid therefore seems to be working its way into my bag every year at the expense of a long iron (soon to be mid-irons). I started the year hitting the 20 degree Boccieri (right image) club in place of a 3-iron which I should, admittedly, have discared long ago. I've always liked the 'Heavy' concept - putters, wedges, drivers - so took to this club quickly, finding it ideal for long Par 3s of about 200 yards. With a little pracrtice it's also great for chip shots from up against a collar of rough, or even from the short grass short of the greeen. When the 23 degree HB4 Miura Hybrid (left) with the blade-like face came along in August, the 4-iron got the boot. It is an extremely versatile club which makes getting the ball into the air extraordinarily easy from a variety of lies - teed up, fairway, light rough, and even fairway bunkers. And when you fit it with a SteelFiber shaft from Bellingham's own Aerotech Shafts, I can more or less guarantee the lucky recipient will cut vital strokes from their score. Available at: Miura is available at Seattle-based Von's Golf - www.vonsgolf.com. Heavy Hybrids can be purchased at www.boccierigolf.com and there are 19 retail locations in Washington (listed on the web site). MSRP: Miura - $279.99 (steel); Heavy Hybrid - $159.99 (graphite). Get it for: Every golfer you know not currently ranked inside the world's top 1,000. 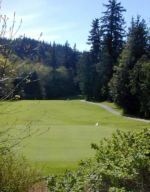 Chat with author Michael Riste at BC Golf House in Vancouver about the history of golf in the Pacific Northwest and it's likely you'll need to pull up a chair and reschedule some appointments. Riste might not care much about how many top-tens Rickie Fowler recorded this season or what irons Phil Mickelson is hitting, but when it comes to the story of how golf took root and developed in Oregon, Washington and British Columbia he is the walking encyclopedia on the subject. Being so well-informed about golf in the PNW means, of course, Riste knows virtually everything there is to know about Arthur Vernon Macan, one of golf's great, but largely unheralded, course architects whose work can be found all across our region (he is thought to have contributed to the design of Bellingham GCC). 'Just Call me Mac' is one for the golf course achitecture geek in the family, admittedly. But it's thorough to say the least, and proceeds of sales go to construction of a new roof for BC Golf House. Nilsson and Marriott have never been the en vogue golf instructors of the day, and probably never will be because: 1) They'll never be Tiger Woods's swing coaches 2) They don't offer 'sugar' fixes which work fine for a couple of holes but unravel sooner rather than later, and 3) They're women working in a laregly male-centric world. Nevertheless, if you are looking for a coaching method that will require some effort and commitment from you to master (it should really be called 'Play Your Best Golf in About Two or Three Months') but which will make you not only a better golfer but a person more able to perform in and adapt to all of life's situations then this is a terrific option. No quick fixes here, just sound, researched, methodical advice that will help make you the golfer you can be. Stan Utley gets it. 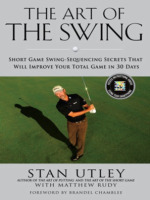 Yes, he understands how to make the most of his new-found fame publishing three books in quick order since being 'discovered' as a master of the short game by Golf Digest a few years ago but, more importantly, he has the ability to turn what can sound over-technical and overly-complex into easy to follow instruction. He does this with the help of video lessons which can be accessed from an on-line library by photographing bar codes in the book. As a result, you get detailed set-up tips and an insight into the correct feel for each shot, and learn the important lesson of how a sound short-game swing can translate into a good full swing. Available at: Amazon.com, and Barnes & Noble on the Guide Meridian. 'Just Call me Mac' is available on the BC Golf House web site. MSRP: The Art of the Swing is listed at $26 but available online for $17.16 plus shipping. 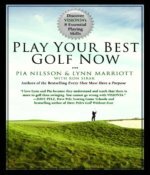 'Play Your Best Golf Now' is listed at $25 but available online for $16.50 plus shipping. Just Call me Mac is priced at $30. Get it for: Just Call me Mac is for architect-heads, the other two are for golfers who not only want to play better golf but also understand how and wy they improve. The Swami 1500 made GPS technology available at a very reasonable price by sacrificing the fancy items more expensive units possessed. Basically all you got was a small and very simple-looking device that gave you the distance between you and the front, center or back of the green. But really, isn't that all you need...if you really need a GPS unit at all? The Swami 3000 costs $30 more ($99.99) and comes with several thousand more courses pre-loaded - over 19,000 of them. It's a great alternative to $400+ units that have the colored screens, hole fly-overs, and stat records but which essentially give you the same info for your upcoming shot as the Swami. Available at: Pro Golf Discount on the Guide, or online here. Get it for: The golfer who likes to get the yardage quickly and not worry about all the gadget's other options. These sorts of accessory are much like the white leather belt - a sign of seriously-minded and seriously good golfers, those who can take on Old Man Par without the need for a couple of strokes a half. If the most competitive you get is the annual office scramble, any combination of belt/wristband/pendant is going to look out of place. But if the golfer in your life is looking for every possible advantage, the ability to balance their bio-field (QLink) or benefit from an 'alternating North-South Polarity Orientation (ANSPO™) system, comprised of 1,000 Gauss axially-magnetized magnets to maximize magnetic field flow' (Trionz) might be what they need. MSRP: Trionz Lite is $22.99, QLink Pendant is $99.99. Get it for: The golfer who still frets about that missed eight-footer on the 2nd green during last month's club championship. On a recent trip to the La Costa Resort near San Diego, I played 18 holes in a sustained downpour that dumped about four inches of rain on the Damian Pascuzzo-renovated North course (which stood up to the conditions superbly well, incidentally) in just a few hours. While my playing partners had trouble maintaining their grip on the club, I had no problem and was able to swing without fear of seeing my club travel further down the course than my ball. It was a perfect opportunity to test a sample pot of iTac2 I had received earlier that week. There's no question it enabled me to 'perform' (and I use that term very loosely) as well over the closing holes as I had on the first few. Rub a little iTac2 onto your hands and your grip on the club becomes almost vice-like without feeling...well, vice-like. Get it for: The poor golfer who gets caught in a monsoon in the middle of a round and wants to maintain a decent grip on the club. 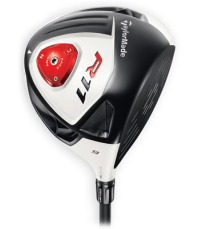 It's the best-selling driver of the year and the price is getting ever more attractive. Enough said. Available at: Pro Golf Discount, and phone around the town's pro shops to check availability and prices. 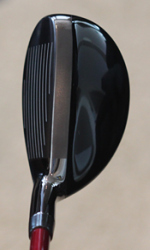 MSRP: Whatever you do, do not buy this club at MSRP. You can pick it up in town for $299.99 and you can get it for even less on ebay. NB Be very, very wary when buying clubs on ebay. You can't see or try the club before the purchase and often sellers don't offer returns. You could very well be buying a fake. My advice is not to even try; just get it for a great price in town from someone you trust. Get it for: The golfer with the out-dated driver. Whatever it takes to keep walking the golf course. If your golfing partner is beginning to have trouble walking 18 holes while carrying his/her bag, but would rather avoid the expense of a cart then a pull cart is their best alternative. The 17.85lb Sun Mountain SV1 is as good as a pull-cart gets with a simple fold-away system that facilitates getting it in and out of the car. There are numerous other features and accessories that make it appealing to those who want to stay out of the cart for as long as possible. Available at: All the town's pro shops offer Sun Mountain products, including the Hitting Zone. Phone around to check SV1 availability and prices. 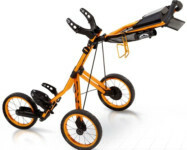 Get it for: The golfer who is desperate to keep walking. It's quite possible you've heard the golfer in your life talking about belly putters recently. This year, thanks to the success of Keegan Bradley, Webb Simpson, Sergio Garcia and, to a lesser extent, Phil Mickelson and Ernie Els, the belly putter has enjoyed a surge in popularity. The argument over whether or not they should be banned for making the dark art too easy is really obsolete now as the USGA and R&A missed that boat years ago, so you need have no qualms about getting one. The Odyssey Sabertooth is a popular model as the dual 'fangs' contain 37% of the putter's total weight and give the putterhead an impressive MoI (moment of inertia) keeping the head stable and resistant to twisting. That should mean more holed putts. Available at: Pro Golf Discount, and all the town's pro shop carry Odyseey putters. Get it for: The shaky putter who is willing to try anything to get the ball in the hole quicker. 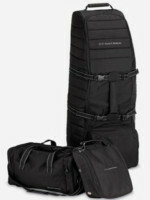 This is a high-quality three-piece set featuring a golf travel bag with in-line skake wheels, duffle bag with large main compartment and double zippers, and a ventilated shoe bag that can hold shoes up to size 14. All are made from 600 denier polyester. 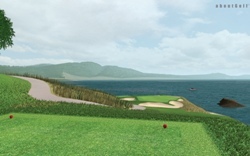 For anyone who travels to play golf, a set like this is an absolute must. Available at: Online golf stores. Get it for: The traveling golfer. 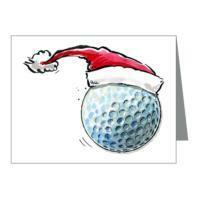 What to say...4.25" x 5.5" notecards with a picture of a golf ball wearing a Santa hat. Get it for: These could be used for gift tags (quite large gift tags), or seperate greetings cards...so you might want to open, and use, them before Christmas Day. 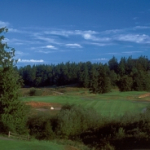 A year's unlimited golf at one of the Pacific Northwest's most beautiful courses starts at just $849. Eight-rounds punchcards are also available starting at $179 (equivalent to $22 a round), and club memberships start at $59. Get it for: Anyone you know who plays golf in Bellingham. 30-minute lesson. Six lessons can also be purchased for $200, and a second person can attend. Spend $50 or more in the pro shop between December 5th and 7th and get a free green fee. Spend $150 or more and get two. Rounds can be redeemed any time before February 12th 2012. Also, spend $100 or more on a Gift Certificate and receive an additional Gift Certificate worth 10% of the purchased card. It might not be a Christmas gift specifically, but Joe Holdridge is offering 2-for-1 play on the simulators at the Indoor Golf Lab on Hannegan Rd all December. Just print out this coupon.